Lab-coat-wearing scientists have independently confirmed that Transhuman Space is one of the most awesome science-fiction worlds ever. However, until now, it has been deficient in what researchers call the "M Factor" -- in laymen's terms, "extensive cool details on creating and running SF mystery adventures." 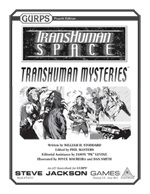 Fortunately, this oversight has been corrected with the release of Transhuman Mysteries. Written by fan-favorite GURPS author William H. Stoddard, this is the ultimate guide for how to run mystery stories in that setting (or most other futuristic worlds, too). This supplement has seven occupational lenses for GURPS Fourth Edition, new equipment, modified infomorphs to aid investigators, plus other in-game info that's sure to help your campaigns come alive. It's also jam-packed with insights into how to create investigative stories in Transhuman Space. It talks about types of investigative subgenres (police procedurals, noir, etc. ), including a suggestion where each would likely occur; how to design and present futuristic mystery adventures; and what works and what doesn't in the world of tomorrow for investigators and criminals. Mystery stories are always popular in gaming; players love to figure out what happened and how. So if you're a fan of Transhuman Space, you'll love Transhuman Mysteries. In fact, if you're a science-fiction gamer in general, there's bound to be useful material in here for you. If you haven't picked this up yet, the only mystery is . . . why not?